I'm sure every kid who, like me, spent hours on end poring over Lego (or Meccano) catalogues, was not doing so in simple appreciation of the masterful design that went into the models. No - we were looking at the parts. Looking, and evaluating. 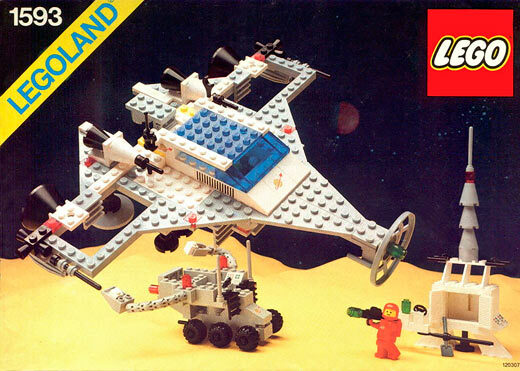 "It's five more dollars for this spaceship over that one, but you get a big engine cone instead of the medium size, and one of the cool new blue spacemen instead of just another red one..."
I developed a great enthusiasm for Technic Lego as well, but Space was my first love. And it had some weird sets. Every now and then there'd be something that was just so super-cool that the parts in it hardly mattered, seeing as you never took it apart. The Tri-Star Voyager qualified in that category for me, and the old Space Shuttle (less confusingly called the Two-Man Scooter outside the USA) was a contender too. The real entertainment was to be had at the other end of the aesthetic scale, though. Sets that you built, looked at, said "I'm eight, and even my spaceships look better than that", and dismantled at once, lest their ugliness prove to be contagious. ...which was apparently built from the wreckage of one or two crashed Gamma-V Laser Craft (which look completely fantastic; my Gamma-V was another of my never-taken-apart models). And then there's this, the Interplanetary Shuttle. It's apparently a mail delivery vehicle... with a control panel in front of the driver, facing away from him. 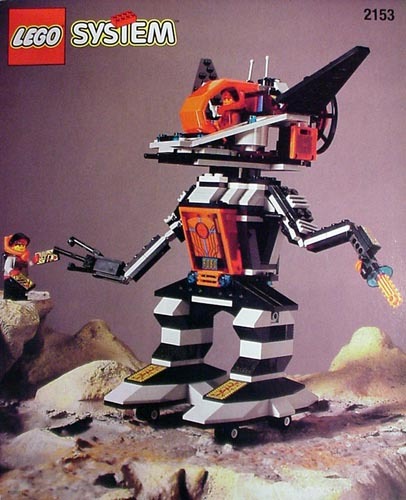 Different Space series had a whole genre of funny looking little robots, the king of which was the mighty 6951 Robot Command Center. The Robot Command Center is the only one on this list that I actually owned - because as a parts pack, it was superb. As a model, though, it was atrocious. It was not only bizarrely misshapen; it also had things on it that didn't even make sense. Those big blue double-canopy jaw things on the side were the most obvious. I suppose the grabber arms were meant to lob rocks into them or something. More subtle were the finned rocket cylinders embedded, for no clear reason, in the Robot Command Center's ankles, just above the skid-jets (borrowed from a more sensible vehicle) on which it, presumably very unsteadily, skated across the landscape. ...with a total of ten wheels, four of which were unable to touch the ground. But unquestionably the Ugliest of the Big Ugly Robots hit the market three years later. I present, with pride, the Robo Stalker. But wait, there's one more. One very special, very rare, very ugly spaceship. Even most real Space Lego enthusiasts have never seen one of these in the flesh, because it was only available, in 1983, as a special promotion with (of all things) Persil laundry detergent. Well, that was the deal for the UK version of the set, anyway - it was apparently available in other countries with some similar deal. On the plus side, you didn't have to send in any box tops - though you did have to send in £9.95, which is more than £24, about $US50, in today's money. Once you've finished wondering how drunk these little Lego men were when they decided to be seen in this thing, I really must insist you check out the full-size original image on the Lugnet site here, because this baby's just full of entertaining details. The cockpit, for a start, has holes in it. Not just the ones you can see above the wing - there are two more on the sides below the wing, and one more gaping hole on the front of the cockpit under the wing. So it looks as if these little guys are going to have to keep their helmets on for the entirety of their mission. And they'd better watch out for space-birds. Set 1593 also features two big main engines mounted on 2x2x2x2 brackets, which are flimsily attached to one-stud-wide rails. And there are ladder/grille pieces (radiators?) hanging down off the body in four places. And, the finishing touch: On the top of the nose of the ship, directly behind the big skeletonised dish, is a two by two turntable. It's just a little bit on the front of the ship that can turn round and round. As far as play value goes, this set is decent. That top-heavy land-crawler thing hooks onto the back of the ship (which doesn't make it look much better...), and there's a sort of base-station... cupboard... contraption, and various accessories. But boy, is it ugly. To make things even weirder, set 1593 apparently contains all of the parts from the perfectly decent 6880 Surface Explorer and the classic, Concorde-ish 6929 Starfleet Voyager. It would appear the latter crashed into the former at full speed, and 1593 - with its very own box and instructions - was the result. But, as with every other one of these sets, you can always break it down for parts. And maybe build yourself a Surface Explorer and a Starfleet Voyager. It's not as if even the ugliest of Lego sets is a stupid Death Star that turns into a giant Darth Vader robot for no reason at all. Any Lego set can be reassembled at will into whatever you want. Which could be why they're still around, after fifty years. 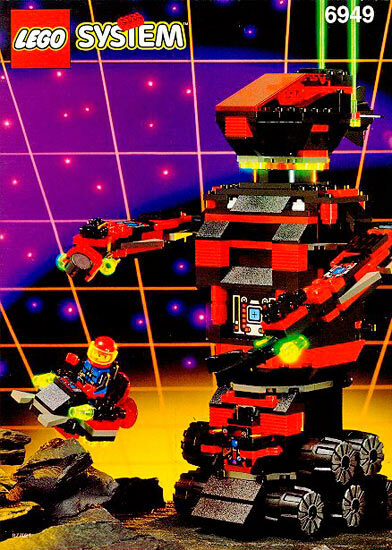 Robo Guardian's upper wheels didn't quite touch the lower ones for quantized-Lego-dimensions reasons, but it was clear to me as a 9-year-old that they were meant to. There might be sane reasons for driving those wheels, and allowing them to drive the lower ones through contact. Perhaps ground clearance, so you didn't have big expensive motors that were anxious to be scraped off on the ground? The model didn't actually utilize that extra ground clearance, but that didn't stop my mind. Obviously, the Mega Core Magnetizer belongs in the of freaking awesome space things that you never actually took apart. I wonder if my HTML will work. Also of note is that Robo Guardian was the first set in all of Lego that had the highly useful 1x1x1x(technic hole) block, which is the reason I had to have it. Wow. That is WEIRD. Another Erik T (My name and initial, naturally, including the correct spelling with a 'k' and not a 'c') commented before me, on a Lego set that I had/have, and said nearly the same thing as I intended to say. I think someone's managed to hook the internet up between parallel universes. Anywho, seen as the comment on the Robo Guardian is already taken care of, I shall just mention that indeed I had one of them, and despite it looking weird was quite a bit of fun thanks to the magnetic arm do-dads. I also had two #6889 Recon Robots. I think they were on clearance or something when I got them. They featured heavily in my film work in the mid 90s... teaching a 8-12 year old kid how to do stop action with a home video camera can lead to some spectacularly boring footage. 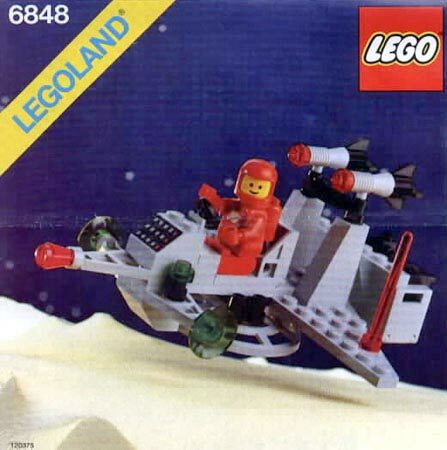 As a kid with no cash whatsoever, my minifigs were stuck scooting around in things like this and this, with space for skinny engines, at least, but no actual cockpit. At least my Galactic Chief could lord it over my brother's Ice Planet Guy, setting unreasonable parking fines and such. There was this HST-on-some-scaffholding widget which didn't even have a canopy. Eventually - around that passing stage of adolescence where I was going off Lego - I got my hands on this thing, which had one of my favourite minifigs ever. Hooray, a proper space ship! Sometimes I left out the little robot and decided that the section behind the pilot was all engine. Shame the legs couldn't go anywhere (except be popped off). Wow, for a minute there I almost "remembered" having Set 1593! It looked so familiar... until you mentioned 6880 and 6929. I had those! Oh, the shame of owning ugly Legos. I'm familiar with the feeling, 'coz I had 6951... I remember rebuilding it again a year or so after I got it, to see if it was as dumb as I remembered it. It was. Great parts, though. No! Robo Guardian was awesome! Not only were the head and the flier thingy interchangeable, but you could detach the lower half of the arms and attatch them to the head. Doing that gave you a flying robo-monster with arms! And the flier could be stored inside the back of the robot! It looks like the two top wheels on the Robo Guardian would touch each other as well as the middle one on the bottom row, resulting in a complete lock-up. Someone should create a global database that would let me input the LEGO sets I own, and figure out which sets I could make from the parts. The world obviously is calling out for that. There's no such thing as 'ugly Lego' kits! Heck I even had the Technic Tractor because... because... it was MORE Technic bits! Especially those BIG wheels, which made fast rubber-band-powered dragsters. the 6929 Starfleet Voyager was bloody awesome. Had one. 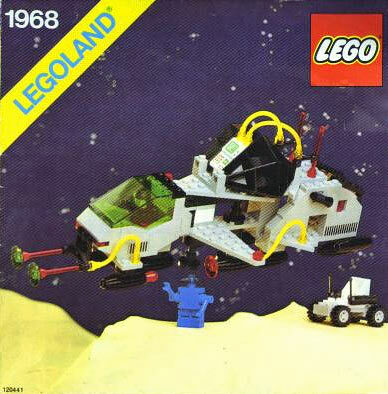 Still have the instructions, and the bits are likely in my 'old Lego mass storage'. It never touches my new Lego - when the did Star Wars + Lego they had me hook line & sinker. I had both the '81 and the '86 Technic tractors, both of which are good models with good parts. But Technic, especially older Technic, has very little option but to be fairly unsightly; when everything had to be framed by beams with studs on, the result could never be all that great looking. But it's what a Technic model does that matters. What most Space models are made to do is be swooped around someone's bedroom, so it's more important that it be obvious which end is in fact the front. If, by the way, you're looking for a cheap small set that'll show you how today's mostly-liftarms Technic sets work, yet another tractor is probably the set you want. I have found by experiment that the little 8281 Mini Tractor is an excellent present both for kids, and for adults-who-used-to-have-Lego. 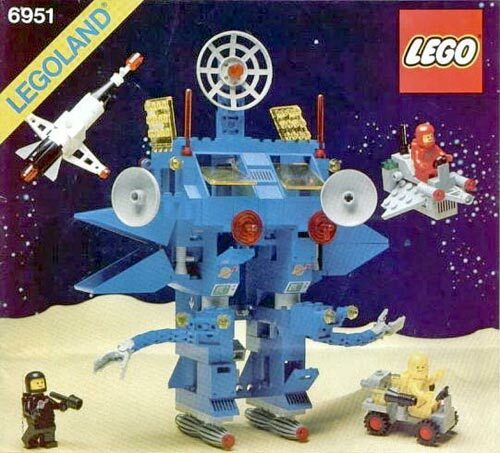 I had instructions to build this giant UFO shapped Spaceship, I don't think it was ever released as a set, but it was pretty weird looking, anyone know what I'm talking about? « Moletech Fuel Saver - the plot thickens!